…so, if you are someone who is wondering how to pick out a trumpet mouthpiece, then this article will hopefully help you with that. This is going to be a long post since I’m going to cover the topic in great detail but I will try to make the article easy to navigate. Make sure to at least read all the subheadings because they will guide you to the exact right parts you need to read. 1) Start with the rime size! What’s your best fit? Start by finding a rim size that works well for you. This is best done by choosing a mouthpiece rime size somewhere in the middle, like for example a Bach 3C. Play scales starting on third space “C”, going down to the “G” below low “C”, and back up. Try different rim sizes and do the same. If you go smaller and the low notes becomes difficult then that rime size is too small for you and this is not your right all around piece. This is assuming you don’t have any special low note playing problems. Also play scales going up into your high register. If you just found a rim size that really honks out the low notes but then the your high register is difficult you should go back one step and try one size smaller again. This is where you might have to sacrifice just a little bit of the robust low notes in order to also be able to go into the upper register. However, you never sacrifice so much than one end of the register becomes un playable. Remember to also play melodies when you are trying out the mouthpieces. When finding YOUR right trumpet mouthpiece you will feel it when playing melodies. You will feel that “this one is the one” feeling. 2) Know that you will have to sacrifice something! When searching for the right all around trumpet mouthpiece we have to know that we won’t be able to find a mouthpiece that will give us the most robust low notes, the easiest high notes, the best biggest sound or the best flexibility all in one mouthpiece. Be prepared to try out different mouthpieces until you find one that gives you the best balance of everything. Don’t go for the one that gives you an incredible easy low register, but makes your endurance suffer and the high register difficult. Or the other way around, don’t go for a mouthpiece that gives you easy high notes but you have a hard time playing notes below low “c”, and your sound suffers…. …you will have to sacrifice something but you also have to be able to do every aspect to some degree. Compromise, is the right word here! 3) Test different cup depths! After finding a rim size that you can move around with, down into the low register, and up into your high register, you should now experiment with different cup depths but keep that same rim size. Listen to the sound: Generally deeper cups will give you a darker sound while a more shallow cup will give you a brighter sound. Different mouthpiece manufacturers have different numbering system. For example the Vincent Bach mouthpieces mark their medium deep cups as “C-cups”…. …to go a bit deeper you should try their “B-cups” and when going for a more shallow cup then try the “D-cups”. The “E-cups” are even more shallow than the “D-cups”. Try them all out and listen carefully to your sound. Which cup depth get’s closes to the ideal sound you have in your minds ear? Test the articulation by doing tonguing exercises and different attacks. How does the mouthpiece respond? Some players, myself included, find that the deeper cups are more diffcult to use for clean and clear attacks. This is especially true in the “semi high” to high register. You should also be aware of the fact that a very deep cup will often make you endurance suffer and make the high register playing more taxing. 4) Use your own trumpet when testing the mouthpieces! If you visit a friend, or go to a music store, to try different trumpet mouthpieces then TAKE YOUR OWN TRUMPET WITH YOU. If you are trying out new mouthpieces on a different trumpet, even if it is the same brand and model, you are playing around with too many variables and thus you won’t be able to make an accurate judgment of how the mouthpieces differs from your current one. This is important. Do not forget this tip. 5) How does the mouthpiece feel on your lips? As mentioned, there are a lot more of them out there but I would recommend that you at least start with these first, as they are well known and reputable brands that have stood the test of time. One more thing to note about the feel and comfort on the lips is that, for some people, a gold plated mouthpiece can feel much softer on the lips than regular mouthpieces. This can help prevent swelling of the lips and thus improve endurance and almost every aspect of trumpet playing. 6) How well does the mouthpiece respond? 7) Standard vs. heavyweight trumpet mouthpieces? …again, play different melodies at different dynamics to really get a feel for the mouthpiece, the core and the slotting AND, as mentioned, the response. Do I like the sound? Can I comfortable move around the registers with it? …because at the end of the day, those are the two most important factors. …this pretty much eliminates all Vincent Bach “B-cups” right away, and for most people, all “C-cups” as well. That said, you will of course find trumpet players that play lead parts on deeper cups but they belong to a minority of players that are fortunate to be able to use one single mouthpiece for almost every playing situation. Just as when choosing an all around mouthpiece the sound is very important here. If you are playing lead then the sound should be more on the brighter side and it has to be able to “cut” like a knife. If you go for a sound that is too dark then you will set yourself up for big endurance problems, as you will be working very hard to make your sound cut through the section. To find the right brightness and ease of playing then try different, shallow cups as well as mouthpieces with different back bores and throat sizes. Sure, we are talking about high note mouthpieces here and we should of course choose a mouthpiece that facilitates the high register, however, what I mean is that the mouthpiece which can produce the highest frequencies (for you) is not necessarily the best lead piece…. …for example: sometimes we can actually play a bit higher with a bigger mouthpiece throat and it may FEEL easier when just testing a few notes. However if playing just a few more minutes on the piece we will find that our endurance dies. Personally, I sacrifice just a bit of my range and go for a smaller throat instead, as this will greatly help me keep the endurance in the upper register. This is something you just have to experiment with and my best advice is to try several different high note mouthpieces for a longer time, during rehearsals and so on, before you make up your mind. Don’t just pick the one that you can get the highest possible note out of, when trying it in the music shop. Lead trumpet players have to play rhythmically, leading the band and a very precise, clear and somewhat sharp articulation is important here. This is why you have to make sure to test the articulation when trying to find your best trumpet mouthpiece for lead playing. Do this by testing your attacks using different dynamics and with different tonguing exercises. Make sure you are able to get the attacks to really “pop” when playing loudly. I have found that for most of my students the Vincent Bach 3C seem to work a bit better than other mouthpieces (you can click the link above to check the price on Amazon) This is also true for myself and for a lot of my trumpet playing friends. …again, I’m speaking generally here and your mileage may vary. You can also check out the gold plated Denis Wick 3C for a good all around mouthpiece, that is very similar in size, but the gold surface on the Wick may help you with endurance, as it’s softer on the skin. Here too I have many mouthpieces that I like, and I have made a detailed blog post about good high note mouthpieces, so I’ll make this very quick…. …and for me, the added mass makes the sound more robust and the notes above high C “locks in” better. In my opinion the gold plated heavyweight is the better one of the two and for me it is also easier to play. The standard and the heavyweight are both the same size though and you should know that the heavyweight is also more expensive. Q: What is the backbore and how does the backbore affect the mouthpiece? A: The backbore starts right after the throat(the hole in the cup), and goes all the way to the end of the mouthpiece. The backbore will affect the sound and the resistance of the blow. A more narrower backbore will produce a brighter sound with more focus and for many people the narrow backbore will aslo aid a bit with the higher notes. A very wide backbore produces a broader sound and is more commonly used by classical players. Again, this is generally speaking and there are exceptions. Q: What is the normal throat size of a mouthpiece and how does the throat size affect the mouthpiece? A: The standard throat size on Bach mouthpieces are 3,66mm (also maked as no 27, or .144″). A bigger throat means less resistance and some people also experience a bigger sound as a result of this. One thing to note is that a bigger throated mouthpieces tends to be more endurance demanding to play and if the throat is too big the upper register tends to go sharp. In addition to this, a mouthpiece with a big throat can make soft playing more difficult. Q: What about the rim? Should I choose a flat or more rounded rim? Some rims are wider than others, why is this? A: It’s all up to you and how comfortable they feel on your lips. Personally I don’t like really flat rims because I feel they limit my flexibility. Some players notice an increase in endurance with a wider and a more flat rim though but the average trumpet player finds that a “medium wide” and a more “rounded rim” gives the best flexibility and comfort. Q: Can the mouthpiece cup be too shallow and what happens if it is? A: Indeed it can. Two things, first: if the cup is very shallow some players find that they “bottom out”, the bottom lip, or both lips in some cases, touch the bottom of the cup and when this happens the vibrations of the lips shuts down. If this happens then the cup is too shallow for you. Second, if the sound is way too bright and shrill then it might also be because of a too shallow cup. 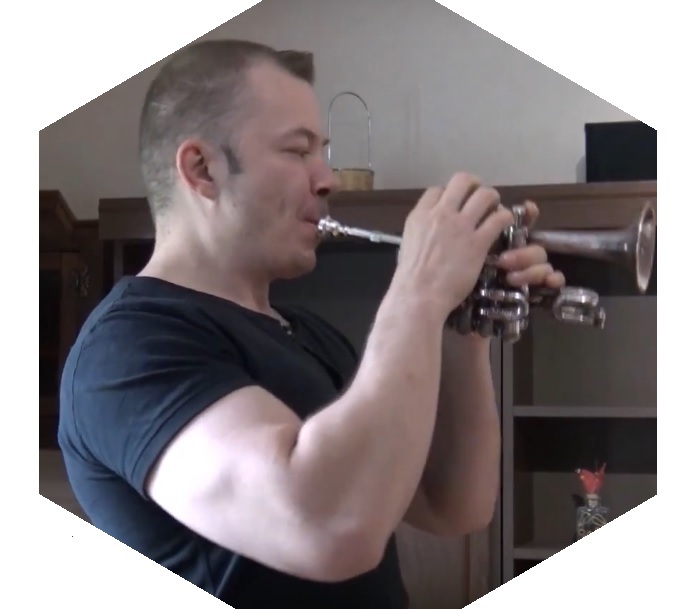 We should all be aware of the fact that no matter what trumpet mouthpiece we choose, the reality is that we still have to put in all the long practice hours. There is not one single trumpet mouthpiece out there that will solve all your problems without you having to put in the work. That said, finding the right trumpet mouthpiece for you is really a great feeling and will indeed help you progress faster. I recommend not being afraid to often try out new things. This is also true for everything in life, not just mouthpieces. On the other hand, don’t become obsessed to the point that you constantly feel that there is something wrong with your current equipment and that there is a magic bullet out there somewhere…. …for every single one of us. I hope you found this article helpful and I wish you good luck in finding the right trumpet mouthpiece. Next Next post: Playing Trumpet With a Mustache-Does Facial Hair Help or Hurt?